One of the journalists responsible for the leaking of the Panama Papers has been killed after a car bomb exploded. Fifty-three year old Daphne Caruana Galizia was a controversial Maltese investigative journalist, who unlike many mainstream media journalists, worked hard at her job to expose corruption and brutality, and it cost Galizia her life. On the same day, self-styled “Gamergate victim” and feminist Anita Sarkeesian was interviewed at The Guardian’s office in London, to complain about a label she enforced on herself. This article’s dramatic headline: Anita Sarkeesian: ‘It’s frustrating to be known as the woman who survived #Gamergate’. Gamergate: An event which killed no-one. Well, at least nobody on Sarkeesian’s anti-Gamergate side. The only tenuously linked murders are those of pro-Gamergater American McGee’s sister, and a male feminist who allegedly murdered his co-worker. 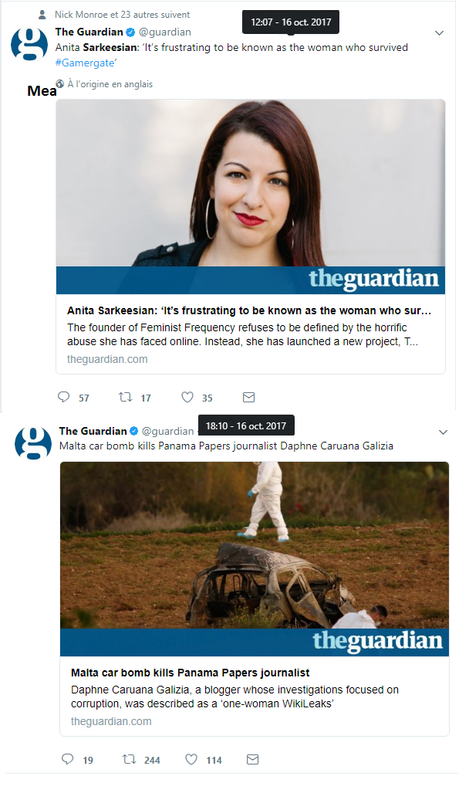 It is incredibly disgusting to see people like Anita Sarkeesian claim to be victims of a murderous mob, when there are women like Daphne Caruana Galizia who actually put in the hard yards, get murdered, and receive barely as much attention as Sarkeesian. It’s true that Sarkeesian has been receiving harassment since the rise of her YouTube series Tropes vs Women all the way back in 2012. When Sarkeesian self-inserted herself into the Gamergate controversy,—which actually involved harassment of another woman, Zoe Quinn, whom Sarkeesian later befriended—she no doubt received harassment. Have a quick gander over Sarkeesian’s Twitter accounts @femfreq and @anitasarkeesian, and you’ll no doubt see people in the comments calling her everything from a scam artist and a perpetual victim to names that can’t even be typed here. However, Sarkeesian has created her career off the backs of these harassers. Without the anti-feminists and regular folk who disagree with her, her career would not exist. Every past article that has mentioned Sarkeesian talks about her Gamergate victimhood in some way. She attends panels and gives talks about internet harassment. She’s even been to the United Nations—with Quinn—to talk about her perceived Gamergate victimhood. The same person who banks on her victimhood status is somehow frustrated about it? Don’t insult our intelligence. Described as a “one-woman Wikileaks”, we should be looking to Galizia as a source of inspiration, rather than someone like Anita Sarkeesian. What Sarkeesian is doing is not changing the world. Women have existed in the video game industry long before Sarkeesian ever appeared on the scene. Sarkeesian—whose knowledge of video games seems to be limited only to Nintendo’s Mario franchise—inserted herself into a controversy she knew would get her money. And money it did. Her Kickstarter for Tropes vs Women netted her $158,922. Her next series Ordinary Women: Daring to Defy History, raised a whopping $207,138. FemFreq’s 2016 Annual Report showed the company’s earnings as $457,225, adjusted down to $343,721 after expenditures. Add her public speaking engagements such as her recent VidCon attendance, and you have even more. She also regularly teams up with major game studios, and has even worked for Google and Twitter Trust and Safety. She relies on her status as a Gamergate victim. Why would she stray away from that? How can anyone take Sarkeesian seriously when she claims to be unprivileged? For The Guardian to label Anita Sarkeesian as a victim of cyber harassment is to ignore real victims of harassment. It is to ignore Rehtaeh Parsons, who committed suicide after bullies treated her so badly after she was gang raped she believed suicide was the only option. It is to ignore the victims of Crash Override Network, the company Zoe Quinn started that allegedly harassed victims who contacted them for support. It is to ignore women like Daphne Caruana Galizia, who fought to end corruption in a corrupt world, unlike Sarkeesian, a corrupt person with an alleged history of scam artistry who capitalized on a controversy that needn’t still exist in the current year. While Sarkeesian should be commended for ignoring those that do harass and critique her, more often than not Sarkeesian herself is the one that is doing the harassing from her position of power. We should be looking for strong female role models in this current age, but Anita Sarkeesian is not the one we should be idolizing. Look instead to someone like Daphne Caruana Galizia. Have Galizia in your thoughts as you look to change this world for the better. Next Next post: Who Do You Trust When The News Media Don’t Even See Themselves as the News?